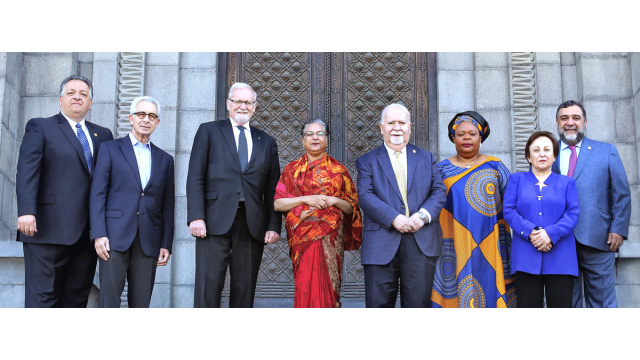 The Aurora Prize Selection Committee and Co-Founders including (from left to right) Co-Founder Noubar Afeyan, Selection Committee Members Ernesto Zedllo, Gareth Evans, Hina Jilani, Vartan Gregorian, Leymah Gbowee, Shirin Ebadi and Co-Founder Ruben Vardanyan. The Aurora Humanitarian Initiative today announced that the 2018 Aurora Prize for Awakening Humanity ceremony, Aurora Dialogues and weekend of inspirational events, will take place June 8-10, 2018 in Armenia. Pre-eminent humanitarians, academics, philanthropists, human rights defenders, government officials, journalists and business leaders from around the world will gather for the purpose of galvanizing action to address today’s most pressing humanitarian challenges and to celebrate the best of humanity. The weekend will culminate with the presentation of the third annual $1.1 million Aurora Prize, a global humanitarian award given to an individual for the exceptional impact their actions have had on preserving human life and advancing humanitarian causes. The laureate is invited to share $1million with organizations which inspire their work. Download photo รูปแบบต่างๆ | นี่คืออะไร? The Aurora Humanitarian Initiative was founded in memory of the survivors of the Armenian Genocide and in honor of their saviors by descendants of the survivors who wish to demonstrate their gratitude by action. The 2018 Aurora weekend of events will feature the Aurora Dialogues, an international platform for academics and practitioners who explore and debate humanitarian challenges. The conference will seek to better understand the issues, analyze lessons learned from the past, and encourage innovative action in the present to foster a better future. A schedule of events and additional information about the 2018 Aurora Dialogues and Aurora Prize weekend will be available in the coming months at www.auroraprize.org. Nominations are now open for the 2018 Aurora Prize. Public nominations will be accepted through September 8, 2017 at https://auroraprize.com/en/prize/detail/nominatenow. Singer and songwriter Charles Aznavour announced the 2017 Aurora Prize Laureate - Dr. Tom Catena – during the May 28 ceremony in Yerevan, Armenia. As the second Aurora Prize Laureate, Dr. Catena was awarded $100,000 in gratitude for his dedicated service as the sole surgeon operating in the war and famine-ravaged Nuba region of Sudan. In addition to the $100,000 prize awarded to Dr. Catena for his selfless efforts, $1,000,000 was designated to organizations of his choosing, which included the African Missionary Healthcare Foundation (AMHF), Catholic Medical Mission Board (CMMB), and Aktion Canchanabury. These organizations, in turn, will continue to offer help to vulnerable and victimized populations, thus continuing the cycle of giving. The Aurora Prize Selection Committee includes Nobel Laureates Oscar Arias, Shirin Ebadi and Leymah Gbowee; former president of Ireland Mary Robinson; human rights activist Hina Jilani; former foreign minister of Australia and President Emeritus of the International Crisis Group Gareth Evans; former president of Mexico Ernesto Zedillo; President of the Carnegie Corporation of New York Vartan Gregorian; and Academy Award-winning actor and humanitarian George Clooney. The late Nobel Peace Prize Laureate Elie Wiesel served as the Selection Committee’s inaugural co-chair.